February is Black History Month, and Dr. Keith Green, Associate Professor of English and Director of the Africana Studies program, has put together a full slate of activities that are inspired by a West African symbol called “Sankofa,” which translates to “go back and fetch it.” Correspondingly, this year’s Black History Month events at Rutgers–Camden revolve around the theme of retrieving ideas, histories, and moments from the past to inform where we stand today. Darnell Moore, a native of Camden, will deliver the Ida B. Wells-Barnett Lecture as part of Black History Month, on February 23rd. A senior correspondent at MicNews, co-managing editor at The Feminist Wire, and writer whose work has been published in popular media such as Huffington Post and The Advocate as well as in academic journals like Women Studies Quarterly and Harvard Journal of African American Policy, Moore also is a passionate activist for social justice issues, particularly those dealing with marginal identity and youth development. He credits growing up in Camden for making him more aware of the world around him, thinking about issues relating to race, class, gender identity, socioeconomic status, and sexual orientation. “My experience in Camden is the avenue through which I began to ask questions,” he says. Moore uses writing as a way to instigate conversation about these issues, calling writing “intellectual activism.” He has also used the classroom as a way to think about notions of disenfranchisement and systemic oppression, teaching at universities such as Fordham, City College of New York City, Vassar, and the New Brunswick and Newark campuses of Rutgers. While in Newark, Moore connected with the vibrant LGBTQ community in that city, and eventually became the chair of Cory Booker’s LGBTQ Concerns Advisory Commission, when Booker was the mayor of Newark. Moore calls his time in Newark a “training ground for oppression, which catapulted me into advocacy work.” He excels in this arena, earning the 2012 Humanitarian Award from the American Conference on Diversity, among other accolades. 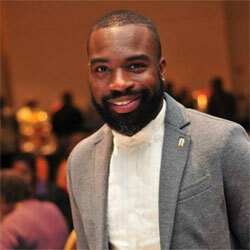 Through his work with LGBTQ youth, Moore was inspired to start the social program YOU Belong, an organization that Moore cofounded with former NFL player Wade Davis II that promotes diversity inclusion through youth development programming. Their first initiative is a four-day workshop that gives sports and leadership clinics to LGBTQ youth and straight allies, as a way to create a safe space and encourage education and exercise. Moore’s lecture, which is co-sponsored by the Leadership Institute and the Women’s and Gender Studies program, will take place on February 23rd at 12:20 p.m. in the Campus Center’s Multi-Purpose Room. All are welcome and encouraged to attend this free event. ‹ Previous: Congratulations to the Fall 2015 Dean’s List Recipients! This page was printed from http://fas.camden.rutgers.edu/2016/02/15/darnell-moore-to-deliver-capstone-address-for-black-history-month-on-223/ at 1:11 AM Wednesday, April 24, 2019.